Beth M. Ley, Ph.D. & Barry Kraft, D.O. 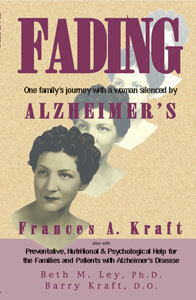 The remarkable story of Fran and her family’s journey with her mother, "Moose," as she battles Alzheimer’s Disease. Smile, laugh, and let the tears well up as you see how God can use what looks like a tragedy to bring a family closer together, and to Him. The psychological impact on the family taking on the role of caregivers is examined, as well as the latest research discussing treatment and prevention of mental degeneration through nutritional and antioxidant support. "An inspiration for all taking on the responsibility of caring for an aging family member ? especially with Alzheimer’s."